Food is personal. We know that. What we often don’t realise is that food is also more than personal. It is also about culture and, most importantly, about biodiversity. We often do not think how the flora and fauna around us make up our culture. We do not think that food diversity, indeed cultural diversity, is linked to diversity in the biological world. As a result, we often do not value this biodiversity that grows in the farm, the forest and the lake and the ocean. Each region of India, indeed the world, is diverse in its food habits. It has its own recipes; it cooks with different ingredients; it eats differently. This is not an accident. Every region, for instance, has its own rice variety. Many of these come with medicinal properties. Most are specific to the ecosystem they grow in. If the region is drought-prone, the variety survives in tough conditions, like Kayame rice of Karnataka. The Orkaima, Pokkali and Kuttanadan varieties found in low-lying districts of Kerala are salt- resistant, hence suitable to grow in seawater. In the highlands of the same state, another rice variety is grown: Navara (in Palakkad), which has medicinal properties and has received the Geographical Indication Certificate in 2007. This richness of variety resulted in culinary methods that were equally diverse and equally rich. Bengal, for instance, has a tradition of cooking different rice in different seasons. This is food and culture. If biodiversity disappears we will lose the food wealth on our plates. Food will become impersonal. It will become a sterile package designed for universal size and taste. This is what is happening today, where food comes in plastic cans. We have to join the dots. Food biodiversity needs our care and attention. With monocultures taking over, the only biodiversity that will remain will be stored inside the cold and controlled environments of gene pool laboratories. It will not flourish in the living world around us. The world that gives us life and the joy of living. Consider makhana, the seed of a member of the water-lily family. The plant grows in the multitude of lakes and ponds that once made up the flood plains of north India. The water bodies were crucial for survival in this region destroyed periodically by rivers that bring water, silt and sorrow. The ecosystem was built by channelling the water of swollen rivers into ponds. This took away the pain of the flood. It provided for storage of water and, in turn, recharged groundwater, giving economic life to agriculture. But most importantly, the wetland gave alternative sources of food. One of which is the protein-rich makhana. Once the ponds are gone, the plant will not survive. Our source of food will be lost. One more taste will be forgotten. One may argue that biodiversity does not need the ecosystem. It can be cultivated and can still be available to us. That is indeed possible. After all, potato originated in far away lands of South America. It was brought to India not so long ago by the Portuguese rulers and is now an essential part of our cuisine. We cannot imagine food without potato. Yet we miss the biodiversity of potato that gives South American food its richness and, indeed, its health. We cannot imitate nature. We cannot manufacture biodiversity. But we can choose to live with it. We can value it in the wild and in the farm. We can savour its taste and smell. This is joy of living. This is what we must not lose. Ever. It is for this reason that the Centre for Science and Environment and Down To Earth decided to put together a compendium of recipes that originate in different regions and plants. 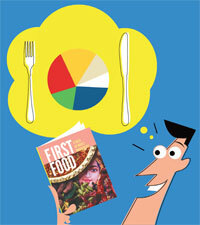 The book, titled First Food, puts together this taste of India’s biodiversity into recipes and information about food and its source. It is an attempt to celebrate the knowledge of plant and their properties; how to best cook them to bring out their flavours and smells. This is lived and living biodiversity. The emphasis is on appreciating the science and art of nature. If we can make nature part of our lives again, make the connection between what we eat and why we eat it, then we can also safeguard this resource for tomorrow. But if we lose the knowledge and culture of our local cuisines then we lose more than their taste and smell. We lose nature. We hope this book will get people to share our passion for food that brings back this connection—between our stomach, kitchen, health and the world around us. Otherwise, diversity in the wild will be lost. We have to remember that it cannot be protected unless we celebrate it in our lives. The theme this year is "Water and biodiversity". The relation between water and biodiversity needs to be understood well.Unfortunately, those who manage water policies do not think of Biodiversity. It is vital to protect and manage water resources to satisfy both human and developmental needs. When will we understand that management of biodiversity affects the supply and quality of water resources? UP has so much population....only few areas covered with trees remain...unless we protect these greenery ...unless we realize the IMPORTANT ROLE OF BIODIVERSITY IN THE WATER CYCLE ..i really doubt if any progress will be made ever!! Encourage us in our humble effort! a happy Biodiversity day on 22 may 2013!! Sunita Narain ji, your write-up for biodiversity is a reminder of the most serious mistake our governments are making at the behest of World Trade Organization (WTO) by supporting/catering to their needs. WTO supports giants like Monsanto who own the genetically modified food plant varieties thus suppressing the indigenous culture of diverse agriculture. These giants can hire our unsuspecting scientists with higher pays/perks and "own" the patents churned out by them. The scientists and our governments forget that the knowledge they have hasn't come out of their loneliness. It is the product of the society and the scientists' interaction. Moreover, they are using the nature(which belongs to all of us) to get their so-called outstanding research. This patenting itself should be discarded and disregarded. The science has to be free for all. Moreover, the diversity can only be maintained in situ (in the original situation). It can be supported by genome storages but cannot be replaced by these. The biodiversity keeps increasing in the nature further by evolving to new stresses. In the cryopreservation, the genes can at the best be maintained as such; they can't evolve further. Why don't these 'stupid' great scientists understand this simple truth? We need a revolution in the thinking of the common people to stop this delude of fraudulent campaigns of the giants. I support your efforts in this direction fully. Thanks. You have raised a very pertinent issue. My family is a great lover of Makhana and we use it in different ways. Slowly, the ponds and wetlands of North Bihar where Makhana grows are vanishing. Reasons are many. In this regard I would like to inform that Sometime back the Publications Division, Ministry of Information and Broadcasting, Govt. of India asked me to write a book on Biodiversity. It was in response to the year 2010 being declared by the UN as the Ã”Ã‡Â£Year of BiodiversityÃ”Ã‡Ã˜. Aim of the Publications Division was to have a book on this important subject which could be useful for general readers as well as for those who had knowledge on the subject. It was a challenge for me as the subject was of technical/scientific nature. To make it comprehensible for all could be difficult. However, I started working on the project and to my delight the manuscript was approved by the Publications Division. It is now published and is available for purchase. The book has large number of beautiful photographs related to Biodiversity, including our Food Biodiversity. Title of the Book is: Living with Others, Biodiversity around us. Yes, the happening and looming threat of the loss of Bio-cultural diversity stares us in the face. This is particularly true for medicinal plants (overwhelmingly found in the wild)and wild foods. We understand most of the issues around conservation of our unparalleled Bio-cultural diversity but are unable to act as too many and too big egos clash in unending turf wars. Like in sports, IPL? Wild foods are also very important because many of these species may offer us options when climate change wipes out a good part of bio-diversity as we have known it. We are only one epidemic away from wiping out major crops because of lack of diversity in the crop varieties we grow. Some time back I read an article that in the Hawaii islands only one variety of Papaya is grown. Now just imagine if this variety is infested by a bug or virus, the the whole population of Papaya will be wiped out in a season or two. Same goes for the few rice varieties that we are growing in India at the cost of forgetting the thousands that were prevalent in India till just a decade or two ago. This article has raised a pertinent issue. It is our responsibility to manage the bio-diversity by appreciating the science and art of nature. Thanks a lot for posting this article. You have a great vision. Keep updating! !